When it comes to skincare, knowing your skin type is just about as important as knowing your name. You won’t get very far without it! Using products for the wrong skin type could mean even the very best ingredients mother nature has created could cause dryness, oiliness, breakouts or even irritation. Ugh. No thanks. Just like your favourite pot plant, your skin is unique and (can be) temperamental if you don’t treat it right. But get the water amounts and fertiliser (nutrients) right and your plant will be a happy chappy and you’ll be well on your way to smooth, clear, plump and moist skin nirvana. You’ve probably heard us talking about skin types - usually “Dry”, “Normal”, “Oily” or “Combination” - but most of us don’t actually know our skin type. It’s because (just to keep life interesting!) your skin type changes. And the changes can happen more often than you would think! What causes the change? Well, heaps of things actually. The biggest ones are the season (your skin might tend to be dry in winter and combination or oily in summer), and hormones. Hormones - don’t get us started! They go haywire when you get pregnant, breastfeed, menstruate, or go through menopause. They can also get out of whack when you’re stressed, your gut health is less than perfect, when your bod is undergoing toxic load, not getting enough rest, or even lots of exercise. So today let’s have a bit of a check in and make sure you’re all over your skin type. If you're testing towards the end of the day, remove your makeup with a gentle, natural cleanser (or just water and a konjac sponge) and wash off the day’s oil and dirt so your skin can start fresh. Alternatively you could do this test first thing in the morning before cleansing (but make sure you did your skincare routine the night before!). Don’t apply any products and let your skin return to its natural state. You don't need to wait if you're doing this first thing in the morning. Now you know what features each skin type is characterised by, determine your skin type based on your natural skin’s characteristics. What do I do with my newfound knowledge? Now that you know your skin type the world of skincare is your oyster! It means you’ll be able to do a stocktake on your current regime and make sure you’re giving your body’s largest organ the right kind of love. In case you’re wondering whether your Happy products are ticking all the right boxes, you can click here to head over to our website and use the ‘Filter by Skin Type’ options on the left hand side (or at the top if you’re on your mobile). Chances are you might need to tweak a thing or 2, and if you have a question please remember we’re always here to help. 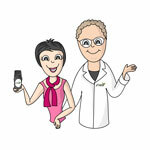 Happy Skincare newbies - ahoy there! We’ve got some sample packs that might help you get your head around things :) Click here to find the right sample pack for your skin type. Just quietly they’re amazing value - with 2+ weeks of skin goodness, free shipping, and a $10 Next Purchase voucher. If you want to dig into this a bit deeper and REALLY understand what’s going on with your skin, try checking our our free eBook. It’s choc-a-block full of all of our best skin wisdom :) Click here to download our free e-book and become an expert on your skin.